The residents of this small city resisted numerous invasions over the centuries, including from Napoleonic France and Nazi Germany. Today it is a peaceful and well-maintained city that takes pride in its past. Since its first mention in Ustiug chronicles in 863 Smolensk has seen a lot, thanks to its geographical position. In ancient times, many Finno-Ugric tribes settled here along with the Krivichi. Those who passed away were buried by the tribesmen in mass graves – in mounds. The most famous of them can be found in the archaeological landscape protection area Gnezdovo mounds. It is believed that Smolensk was founded in Gnezdovo, where the main commercial artery of Eastern Europe, the route from “the Vikings to the Greeks” was located. Smolensk is on the Moscow-Minsk-Warsaw railway with several daily trains to/from Moscow (six hours). The city was repeatedly destroyed down to the ground but afterwards rose from the ashes once again. It was also often passed from one another: in the XIV century Smolensk was part of the Grand Duchy of Lithuania, in the XVI century – became part of the Polish- Lithuanian Commonwealth. 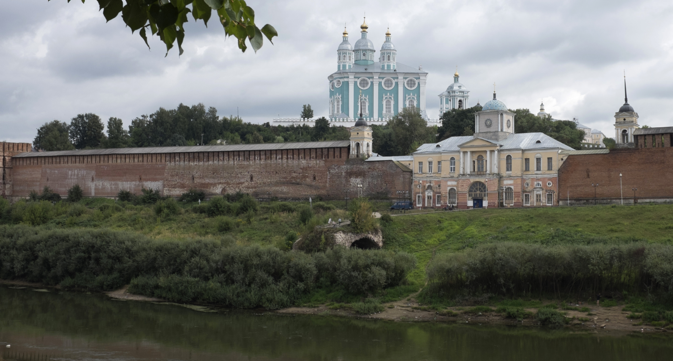 In 1654 the city became part of Moscow, but that was not the end of Smolensk’s vicissitudes. Under Peter I, Smolensk participated in the war against the Swedes for the Baltic lands. In 1812, Napoleon came here using the Old Smolensk road, and in the 20th century – the Germans, who occupied the city for two long years. Smolensk eventually became the centre of the partisan movement. In 1943, the city was liberated. In the 1950s the city was rebuilt and actually built once again; industry was raised from obscurity and people began to restore monuments. The first thing you need to do when you arrive in Smolensk is to climb up to the defensive wall, which was built in the 16th century by the architect Fyodor Kon. Here he is remembered and deeply loved. This is not surprising due to the fact that the wall withstood several sieges and is still standing today. It took just 6 years to construct that wall, which is 6.5 kilometres long, from 12 to 16 metres high and 4.6 metres wide. Out of 38 towers only 17 still exist. “They say that in the wall there is the skull of Reverend Mercury Smolenskiy’s horse – if anyone leans against the wall and hears neighing, then there will be trouble in the city,” according to a city guide. This wall is like a magnet for romantics. Couples hide in the towers amidst construction debris. They hug, walk, and look at the panorama of the city. The first thing that catches the eye when taking in the panorama of Smolensk is the majestic Cathedral of the Assumption - or rather, a whole complex of buildings on the Cathedral Hill. Since the 18th century, the cathedral, which was built in the period of almost a hundred years, has not lost its beauty – it practically touches the clouds with its five golden domes. In the 12th century in its place there was the Monomakh Cathedral - the main stone church of the city. In 1611 the Poles blew up the cathedral and in its place they built a Polish Roman Catholic church. Inside the cathedral, which during the Soviet era served as an anti-religious museum, there is an amazing five- tier iconostasis of the 17th century, which is decorated with gold- plated floral ornaments. In this case five-tier means five-story iconostasis. In the cathedral there are three main sanctuaries: the icon of Lady of Smolensk Hodigitria (which means “showing us the way”), iron sandals of reverend Mercury Smolenskiy and a shroud which was embroidered in Yefrosinia Staritskaya’s workshop. According to legend, the icon painted in Smolensk by evangelist Luca was brought to Rus from Byzantium and saved the city from the troops of Baty Khan. Reverend Mercury is also associated with the Tatars: there is a legend that during the Mongol invasion of Russia in his dream he saw the Virgin Mary who told him to go straight into the enemy camp and to fight them. The reverend knew that he would die, but he still went to fight the enemy. Thanks to his act of bravery the Tatars did not demolish Smolensk and soon moved away from the city. For centuries Smolensk has been a multinational and multi- confessional center. In the city you can easily find an inactive Catholic Church and Lutheran Church, where a chess club is now held. Smolensk is a living testimony to war. There is a square in memory of the Heroes of 1812 – an alley of busts starting with Commander Kutuzov. Near this alley there is an oak tree growing from an acorn from the tree found at the grave of the Commander in Poland. Here he is especially respected, even though he was born in Saint Petersburg and spent his childhood in Pskov. Nevertheless for the Smolensk locals Kutuzov is a personal hero: the first monument erected in the devastated city after World War II is a monument to Kutuzov on the Cathedral Hill. Heroes of the Great Patriotic war are buried in the ramparts. The pride of Smolensk is Mikhail Yegorov, who was the one to hoist the Victory Banner over the Reichstag. Monuments, obelisks, and stele dedicated to heroes of the war can be found all over the Smolensk region. Those who fell in battle and who defended the city are remembered and mourned. You can also go for a stroll in parks, such as the Lopatinskiy garden, which is named after Alexander Grigoryevich Lopatin, who used to be the governor of the Smolensk Region from 1871 to 1880. You can even find swans, swimming nearby – both black and white. Besides that there are fat ducks. When the garden was 140 years old, a special visitor’s centre opened up for guests of the city – a real Smolenskiy chamber. If you arrive in Smolensk and you don’t know where to go, this place is for you. Another garden that can be found in Smolensk, the Blonye garden, is the opposite of the aforementioned one – it is small and a bit elevated. It is located across from the Lenin square, where you can find the building of the region’s administration and Vladimir Ilyich made out of granite.